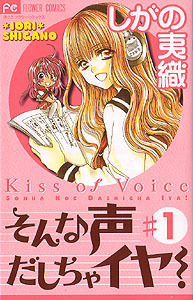 Hina-chan is a young girl who aspires to be a good anime voice actress. Her dreams come true when she is selected to play the lead in a new spring anime called “Vamp”. Even more amazing is her co-star, Yuki HAZUMI. Yuki is a famous voice actor. He has a lot of fans, and is basically the hot idol star of the voice acting world. He has the lead role as the vampire. All the other voice actresses can’t believe Hina was selected for the job, and many of them are bitter and jealous. Hina is a cute, naive, and shy girl, and she can’t believe she will actually be meeting Yuki in person. But meet him she does, and he is just as cool and amazing as she had heard. During their first recording session, Hina is so flustered and awed when she hears his great voice in person that she has a difficult time concentrating on her role. However Yuki is very sneaky.